Animation for Iphone X - Fast animations for everyone! Animation for iPhone X is a service which automatically generates the 52 blendshapes needed to use the iPhone X as a powerful and accessible MoCap device. It works for any character and morphology, from scanned heads to photorealistic 3D models or cartoonish characters, preserving the user's topology. Animation for iPhone X is compatible with major 3D software and game engines - Maya, Unity & Unreal Engine. The animation data from the ARKit Face Tracking will drive the 52 blendshapes of your character with no additional rigging and modeling required. This service is available in 3 different delivery formats: FBX for general use, Unity and Maya. For more information about what comes with each package, please see down below. To automatically get the 52 ARKit blendshapes for any character, simply purchase this service, upload your 3D model and download the result! Scroll down to read more on our facial animation services and technical details. How does the iPhone X ARKit facial animation work? What is the ARKit Face Tracking? The AR FaceTracking Configuration of the iPhone X uses the TrueDepth camera to provide real-time information about the user's face movement, accurately driving a set of 52 blend shapes. This feature is used to animate iPhone X animojis, but it can also be used to animate any virtual characters in a real-time or pre-calc environnement, transforming the iPhone X into a powerful and accessible MoCap device. Our set of 52 blendshapes closely follows the ARKit 2 documentation, including the new shape for tongue movement. The set is delivered with the ARKit 2 nomenclature unless the user requests otherwise, and comes ready to be animated thanks the the iPhone X Face Tracking. Animation for iPhone X works for any type of character, whether it’s a scanned head, a photorealistic 3D head model or a cartoonish character, no matter the morphology. Delivered expressions are perfectly adapted to the specific topology and UV of your 3D model. Animation for iPhone X can be included directly into your character pipeline and won't require any further adjustment on your end. How does Animation for iPhone X work? All you have to do is purchase this service and upload your 3D model. You will automatically get it back within 24 hours with the complete set of 52 ARKit blendshapes, directly transferred onto your mesh and perfectly adapted to the morphology of your character. We also provide plug and play options for those working in Unity & Maya - contact us if that's the case. What do I get when I use Animation for iPhone X? All packages contain 52 blendshapes. The shapes are hooked to specific areas of the face to avoid unwanted movements and cover all the types of facial deformations covered by the ARKit Face Tracking. - Maya package with an additional rigged Maya scene for manual adjustments. - Option FBX is an .fbx file with the 52 blendshapes that can be imported in any software. 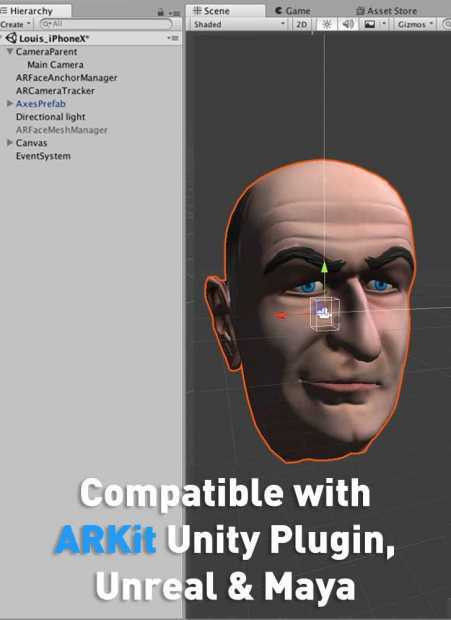 - Option Unity is a plug-&-play Unity project already set-up with your character, packed with an iPhone X app to record the facial animation in real-time thank to the Unity Facial AR Remote. Thanks to this option, users don't have to set up and adjust their character themselves in Unity, or build their own Face Capture app with Xcode. - Option Maya is a package containing an FBX file with 52 Blendshapes as well as a rigged Maya scene with the same set to allow for manual adjustments to fine tune the animation. If the user sends us the animation data, we can also transfer it on the Maya scene instantly, saving your precious time! What should I upload if I want to use Polywink's Animation for iPhone X? A 3D model with a neutral pose (eyes open and mouth shut) and two additional elements: eyes and inner mouth (teeth, gum, tongue). Additional features like eyelashes, eyebrows, or beards should be included. Different geometries can be combined in one mesh, as the result will be combined in order to work with the iPhone X Face Tracking. 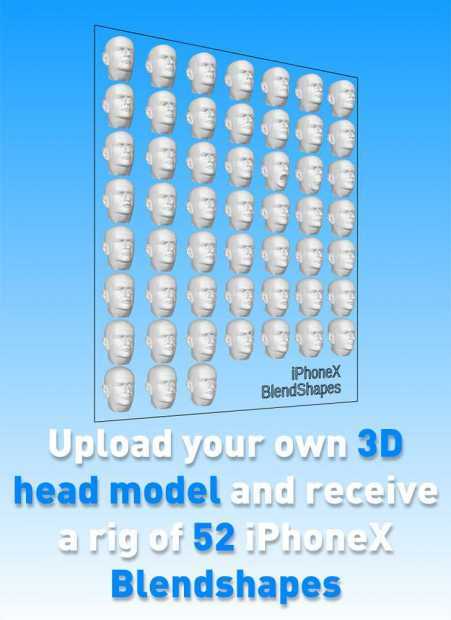 This datapack sample is an FBX file containing a head sample of our virtual model Louise with 52 iPhone X blendshapes, fully compatible with iOS ARKit. Download it now to try out our Animation for iPhone X service!